Dossier – Longo, Robert. 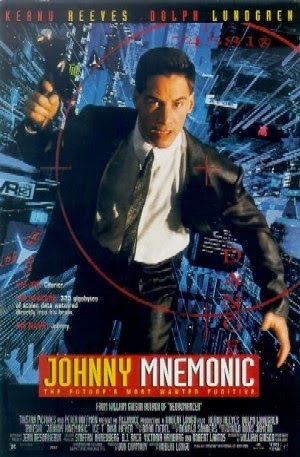 Johnny Mnemonic (1995). Filetype – film (of sorts). File under – cyberpunk derivative (but also proto-cyberpunk, as it was based on the eponymous 1981 short story by Cyberpunk doyen William Gibson, predating even Neuromancer). High-tech – cool ideas like 'wetware' brain datajacks and storage capacity (of a mind-blowing 160 GB, slightly bigger than my crappy smart phone's!) and monofilament whips and virtual reality gloves and visors and so forth are present, but depicted in what passed for mediocre special effects in the mid-90s, making it all feel (and look) like a goofy Shadowrun session gone wrong. Low-life – Director Robert Longo (whose film career didn't exactly blossom after this little gem) does deserve points for the mise en scene (consistent with his 'real' job as a sculptor and painter), as the film was shot mostly at night, and is filled with establishing shots which nicely illustrate just how crappy everyone's life is who is stuck near the garbage heaps of cities like Newark (an analysis which is perhaps true in the real world of 2015!) compared to suit-clad bourgeois stooge Johnny. But the Lo-Teks, a bunch of idiot luddites with a ton of crappy weapons and a combination magic dolphin/microwave emitter, failed to win me over; I was rooting for the Yakuza throughout, since at least they had style. Dark times – It's standard dystopian fare—mega-corps rule the world, and unless you work for one of them (in which case you're a mega-villain by definition), chances are you're a grimy "Lo-Tek" resistance fighter/casualty living in a literal dump, which is what the world apparently turns into if corporations are allowed to seek profits (anti-capitalist ravings that no one took seriously in 1995, or doubtless more than twelve people would have gone to see it). The film adds the wrinkle of a disease, the Black Shakes, which is brought on by exposure to the now-ubiquitous electronics of the world, but that's silly and in any case everything is reduced to the simplest and most Manichean moral terms imaginable: either a character is a Good Guy (one of the Lo-Teks, or Johnny himself, or 'Jane', etc.) or irremediably Evil (bright-eyed monofilament whip wielding Yakuza assassin, Dolph Lundgren's bizarre Preacher guy, Ralfi). The only character to show any moral complexity is the Yakuza/Pharmakom exec played by, that's right, comedian and gritty crime film director Kitano Takeshi, though his change of heart is stupid and merely involves transforming from Evil into Good. Legacy – Johnny was without a doubt one of the most high-profile (and high-budget) film adaptations of a cyberpunk story in the 1990s. On the other hand, given its mediocre subject matter and less than mediocre execution, it got exactly the critical and box office reception that it deserved. In retrospect – One feels slimy echoes of Michael Crichton's histrionic Rising Sun here. Johnny was made in the mid-nineties, when social anxiety about the impending 'takeover' of the U.S. by Japan wasn't yet recognized to be totally ridiculous. It was a time when people could apparently imagine a dystopian future where soulless Japanese pharmaceutical executives would join forces with heartless Yakuza to crush the world in their iron grip. In fact, I thought that aspect of the story was pretty silly way back when I first saw the film, twenty years (!) ago, and it hasn't aged well. I guess what I'm saying is that the most dystopian parts of Johnny are also the weakest parts of the story. The Japanese have not conquered the world (or, if they have, they did a lot better job hiding that fact than the Yakuza thugs do in the movie! ), and no terrifying Black Shakes has arisen to doom the most technocratic of us. Incidentally, I've heard the main plot of the film, which concerns said Black Shakes and a certain megacorp too selfish to release its cure, was the most infuriating change from story to film, and alienated many Gibson fans from Johnny. Having never read the story, I didn't need any such fancy justification—Keanu Reeves (it was pretty much his epic "I want ROOM SERVICE!" rant that nailed the coffin shut on Johnny for me) did it for me free of charge. Except for the price of the movie ticket, now that I think about it—curses! You may have won that round back in 1995, Reeves, but the film also delivered your career a nearly lethal blow; I'd call it even. So there you have it, folks. Johnny failed to win over audiences back in 1995, when its vision of the faraway year of 2021 probably sounded marginally less absurd; it doesn't have a prayer of winning anyone over now! Not all of its problems stem from harmful changes to the original story in the process of film adaptation, however; some of the most ludicrous ideas are right there in Gibson's original vision of the future, like heroin-addicted uber-dolphins. Actually, the film made a small improvement—it eliminated the dolphin's chemical dependency sub-plot, judging it (correctly) to be stupid and irrelevant. No, Gibson: in the future, drug problems won't be so severe they've begun extending to other species, and dolphins can't microwave Dolph Lundgren! Zhaoyun, no prophet of the future, can nonetheless spot ridiculous predictions and Manichean ethics when they crop up, and since 2013 has been taking great pleasure here at Nerds of a Feather in eviscerating books and films that spew forth such drivel.